In February, Martin Bedford handed over the reins of the EAHAD Nurses Committee to Elsbeth Müller-Kägi, who will serve as chair for the next two years. 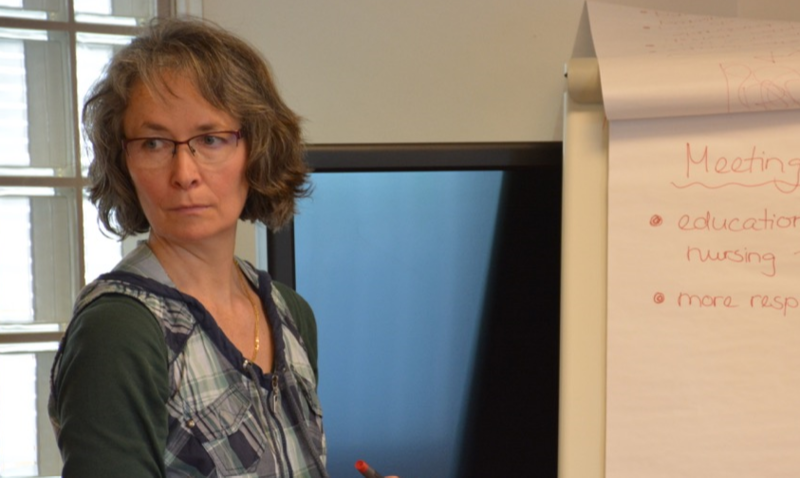 By way of introduction, we asked Ms Müller-Kägi a few questions to get an idea of the joys and challenges associated with her work as well as her experience as a haemophilia nurse, both in her country and on the European level. Since 1998, I have worked at the Children’s University Hospital in Zürich, Switzerland. I was working on the ward with children with congenital heart diseases, but, in 2010, I had the opportunity to move to the haemophilia field. In parallel, I did my Master of Science in Nursing. The physician responsible for haemophilia patients asked me if I would like to be the centre’s first haemophilia nurse. Up until then, there was no nurse dedicated to haemophilia patients. I love to help enable parents, as well as children or adolescents, to begin home-treatment and self-treatment, respectively. It is always a highlight to my day when a parent or a patient is successful with a venous puncture. It is an event to be celebrated for sure! Venous access in babies or little children is the most difficult part of my job. Since it is a life-long treatment, it has to be implemented in a non-stressful way, but non-stressful venous access in a 1.5-year-old child is always a challenge. It was in Brussels in 2014. What motivated you to become involved in the EAHAD Nurses Committee? By the time I got my Master’s in Nursing, I already had a “vision”: I wanted to be active within EAHAD. Even with what I considered my limited experience and coming from a small country, I knew that supporting EAHAD projects and the development of the nurse’s role was crucial. I would love to see an EAHAD Congress with an increased multidisciplinary representation. A great step for me would be that the sessions are chaired, throughout the whole congress, by physicians, nurses, physiotherapists, and psychologists. That would be an unequivocal sign of collaboration and partnership. What do you hope to achieve in your two-year term as Nurses Committee Chair? That’s a great question! My first task would be to create a team vision within the EAHAD Nurses Committee. This would be followed by a clear approach for the Pre-Congress Day at the annual EAHAD Congress. We need a well thought-out plan and programme for the next 5 years. I want to get nurses involved in chairing Congress sessions. Also, getting at least one nursing topic, presented by a nurse, into the main program would be a great achievement. But, before all that, I want to make abundantly clear that I fully depend on the support of the Nurses Committee. Let’s see where we are able to go! Do you have any advice for nurses entering the bleeding disorders field? The role of a nurse can vary a lot depending on the country, both in terms of nursing duties and how their perspective is valued within the multidisciplinary team. For me, following the advice of and working with an experienced nurse helped me very much to develop my skills and make the role of a haemophilia nurse my own!